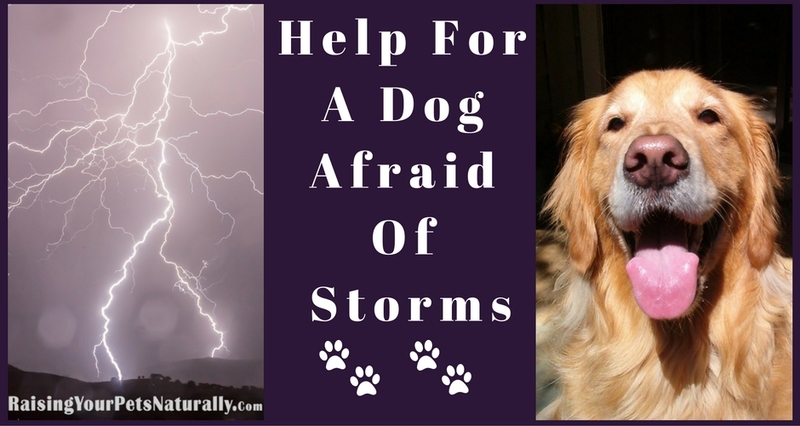 Treating A Dog Scared Of Thunder Storms Thunderstorm phobia in dogs can be one of the most stressful behavior problems to overcome. To live and witness our beloved dog going into a full blown panic attack with each rumble, truly is devastating. It is not uncommon for dogs that are afraid of storms to drool, pace, dig, rapid heartbeat, shaking, destroy things, defecate, and even cause injury to themselves. Having lived with an extremely thunder phobic dog, I can tell you this is not an easy phobia to address and can really affect your own life. Dogs At Risk It is estimated that 15-30% of dogs suffer from thunderstorm phobia. The Journal of the American Animal Hospital Association conducted a survey and concluded that herding dogs, hounds, and dogs that are rescued have a higher rate of thunder phobia. Dr. Nancy A. Dreschel also conducted a survey and found that Golden Retrievers were also at a higher risk. According to Dr. Karen Overall, 70 percent of all dogs who are fearful of other noises also have storm phobia and 90 percent of dogs with storm phobias are fearful of other noises. She also notes, that 70 percent of dogs with noise or storm phobias also have some form of separation anxiety. A dog’s personality can play a big role in how they respond to stress, noise, and unfamiliar situations. If a dog is clingy, fearful, and nervous or lacks self-confidence, they can be more prone to develop behavioral problems. Confident and well-socialized dogs rarely develop extreme phobias. Medical issues always need to be addressed with your veterinarian. You should talk to your veterinarian to rule out cognition dysfunction, hypothyroid disease, arthritis or blindness. Of course, any dog that develops a behavioral condition should always see their veterinarian for a full medical work up. Pain has a way of surfacing through behavioral problems in animals. Traditional Chinese Medicine has been around for thousands of years. According to their philosophy, when a dog has a panicky personality, full of stress and anxiety, he would be considered to have a Shen Disturbance. The Heart Shen allows the dog to be calm and relaxed, something these dogs cannot do. Phobias Get Worse Over Time A true phobia will get worse over time if not treated. A typical guardian will see subtle signs that their dog is stressed during storms, but they do not seek professional help during this time period. Dogs who are at greatest risk of developing a phobia will start to get gradually worse during each passing storm. With constant exposure, the dog can easily get to the point that the dog guardian can no longer calm the dog down during a storm, or worse yet, the dog will cause destruction of the home, or injure himself. The sad part is if the pet guardian sought out guidance, in the beginning, they would have an easier, and more successful resolution to the fear. Treating Thunder Phobia At this point, those with thunder phobic dogs are wondering how to “fix” the problem. I wish there was a simple solution, but, unfortunately, there is not. There are so many factors involved with this phobia (severity, length of problem, how many storms, dog parent’s ability to manage) that finding the right treatment plan can be difficult. A dog guardian will likely try a few different ideas, and combinations before finding out what will work for their particular dog. There are a few general guidelines that every good treatment plan consists of, counter-conditioning and desensitization, adding calming aids and safety and management. Counter Conditioning and Desensitization Desensitization is a process in which you would reduce the strength of a response to a certain stimulus, thunderstorm triggers for this purpose. Desensitization works by gradually exposing the dog to low levels of the stimulus. Counter conditioning works best when used along with desensitization and involves pairing the stimulus with a new association. In other words, you will be providing something good and valuable to your dog in the presence of a low-level and tolerable stimulus. This will start to change the dog’s present negative association with something to a positive association. This has to be done below threshold (being afraid) in order to work. This is what makes thunder phobia very tricky to treat. An example would be if your dog can tolerate the sound of loud rain, you would give him a tasty treat during the rain. Rain=Reward/Feeling Good. Preparing For Thunder Season During Off Season The best treatment plan involves working below your dog’s fear, so off-season is the ideal time to start your behavior modification program. This will help to ensure no over threshold storms, and offer you plenty of good desensitization and counter conditioning lessons, before “real storms” roll in. Your first step is to make a list of all your dog’s triggers that lead to him feeling anxious. Typical storm phobia triggers can include: The wind, rain, dark skies, barometric changes, lights flickering, smoke detector, computer re-boot or various noises. Next, you want to pair these triggers with something your dog finds valuable. An example would be, set one of your household lights on a timer, and when the light goes off, immediately toss your dog a high-value treat such as cooked beef. Or, set your sprinkler on low, just to hit a small portion of your house, while you and your dog play one of his favorite games. To work on loud noises, I like to use the internet and do a search of thunderstorms and play the noise at various levels on various devices around the house. You can play a thunderstorm track on your smartphone, and tuck your phone on a high shelf. This will allow the noises to feel more real. Help Calming Your Dog The best thing we can do for our anxious dogs is to help them lead the most stress-free life as possible and to work on confidence boosting and coping skills. Treating thunder phobia in dogs is about teaching your dog to tap into new emotions during a storm. It is not about teaching him “not to” but rather “how to feel”. The goal is to give them a sense of being relaxed, safe, and happy. Anything that can be added to your dog’s daily life to help elevate his stress will prove to be beneficial. The success of your dog’s treatment depends on him being stress-free and relaxed. High-Quality Appropriate Diet I am sure you have heard the old saying, you are what you eat, this holds true for our dogs too. Having a proper diet and nutrients is essential for their physical, emotional and mental health. For dogs with Shen disturbances, a cooling diet that contains duck, rabbit, and cod can be very helpful. A neutral diet such as beef or pork will also work. Some other foods that help balance your dog’s nervous energy include sardines, sweet potatoes, chicken eggs, seaweed, kelp, apples, and spinach. A tailored diet that is home cooked is the ideal approach to assure your ingredients are from pure, wholesome food sources. Learn more in What’s For Dinner, Dexter? Safe Place For a thunder-phobic dog, having a place to go, and learn to relax is important. Ideally, this will be a location that is as quiet as possible such as a basement or a room without windows. If this is not possible, you will want to do whatever you can to help make a room as sound-proof as you can, and block outside light, or lightning flashes. Heavy curtains, sound curtains, thick blankets, bookshelves against walls, door sweeps or sound-proof panels are pretty easy ways to decrease the sound in a room. If you are able to remove the carpet to prevent static buildup, even better. Storm Defender Cape Most thunder phobic dogs seek out hiding places that are grounded, such as a bathtub or behind the toilet. This is because those locations are electrically grounded, and do not give off a static shock like a carpet does. The Storm Defender Cape has a special metallic lining that lies directly on the dog’s fur, allowing the cape to shield the dog from the static in the air. Adaptil, D.A.P (Dog Appeasing Pheromone) Adaptil is a synthetic pheromone released by a mother dog after her puppies’ birth. This pheromone is related to the attachment process between the mother and her puppies, sending a comforting feeling and signals security. Mutt Muffs Mutt Muffs are made to reduce noise for dogs. They are designed specifically with a dog’s head in mind and are contoured to fit properly and comfortably. Their inner sound-deadening foam is the same density found in a pilot’s headset. White Noise or Music Adding background noise to help mask the sound of thunder can be quite helpful. You can try classical music, the radio, television, large fan, or a CD specifically developed for storm stress. Thundershirt’s Calming Cap The Calming Cap reduces a dog’s visual ability with a single-panel sheer fabric allowing enough vision for a dog to comfortably maneuver around, yet reduces aggravating visual stimuli. Over The Counter Anti-Anxiety Options One common misconception about treating your dog with over the counter remedies is that they are always safe, in reality, this is not always true. If you opt to try an over the counter aid, it is still advisable to speak with your veterinarian about proper dosing and possible drug interactions with other medications your dog may be taking. If your veterinarian is unfamiliar with the below list, you can check with a holistic veterinarian who may be more familiar with these options. Medication A combination of behavior modification and drug therapy may be recommended. If your dog currently panics, tries to escape or hurts himself during a storm, or while you are away during a storm, please talk to your veterinarian. Medication affects the same neurochemical pathways involved in learning allowing you the help your dog develop new, positive memories associated with storms. Using the right medication along with a good behavior modification program can speed up the rate of treatment. Before taking Sileo, read my article- Noise Phobia and Thunder Phobia in Dogs: Is Sileo The Answer? Be There For Your Dog This is the most important part of living with a thunder-phobic dog, and sometimes the hardest. Your dog truly needs you, or another person with him during a storm. If you can imagine being terrified and alone, and not knowing if you are going to be safe, this is what your dog is feeling. Being there will aid in your dog’s sense of security and safety. And, please comfort your dog. The old theory of reinforcing a fearful behavior has been discredited by research and science. Fear is an emotion, not a behavior, and your goal is to teach your dog to be emotionally content, not afraid. You will also be teaching your dog that they can count on you to keep them safe when things are scary. Do You Have A Thunder Phobic Dog? I will help you learn some strategies to help your dog that suffers from thunder phobia. Available as an in-person consultation or via global dog training services (phone, email, video learning). In this specialized dog behavior modification program, I will teach you tools on how to keep your dog safe during storms while you start a behavior modification program to address your dog’s phobia. We will discuss a long-term treatment plan, pheromones and other protocols to assist in your dog’s comfort during storms. We will also discuss how thunder phobia can increase your dog’s chances of developing separation anxiety and what you can do to try to prevent a second disorder. Contact me today to ease your dog’s thunder-phobia. Great article and tips, thank you. I had never heard of the calming cap before. Luckily our dog is not thunder phobic, but we also don’t live in an area with frequent thunder. Great article with lots of helpful info. While the Lapdogs aren’t fans, they don’t have extreme fear either. What an amazingly detailed and informative article! Thanks so much! Henry is somewhat reactive to storms so I know this will be useful. Fantastic article and wonderful tips. As a tribe of five felines, we experience other phobias..vaccuum-monster phobia, doorbell phobia, etc. and many of the tips you noted here work for our guys. And, we’re great fans of essential oils although you have to be careful which ones you use with cats. We use Jackson Galaxy’s spirit essences and Feliway to calm our kitties. Thanks, Anita. Yes, training kitties works too! 🙂 Yes, oils and cats…dogs and us too, have to be done carefully. I’m going to do more research on cats and oils and write an article. Thanks for reading. We don’t really get thunderstorms here thankfully. Very rarely. Mr. N did OK with the one that happened when we were visiting the Midwest. I would have thought he would have freaked out more because he doesn’t like fireworks. Great tips and applicable for cats too. Our summer storm season starts in November, so the reminder is timely. We use a thundershirt for one of our scaredy-cats which does seem to help. I’ve tried most of these with minimal luck. I”ve found the Thundershirt to work best. Wish your post was out when I was looking for information. Thanks for posting. Having lived with an extremely thunder phobic dog, I can tell you in those dogs it’s about helping and decreasing the anxiety, not a cure or fix. It’s tough and was certainly an on-going process for us on and off season. For us, it was a lifestyle. Thunder is tough for kitties too, though dogs seem to take it worse. I like the idea of pairing the stimulus with something positive and the idea of having a safe space. With cats, having a safe space is really key. It is hard to imagine what thunder must sound like to our pets whose hearing is many times greater than our own. Fantastic post. We have one, possibly two phobic pups (we’re still figuring Jack out). Our holistic vet just suggested Henry might have hypothyroidism (like his mama). And, he does have mild separation anxiety! Excellent and informative post. My furangel Chelsey had thunder (and fireworks) phobia. Thankfully, my FiveSibes Huskies have not been. I am starting to see a little “something” maybe happening with my partially deaf girl with fireworks (nothing with thunder as of yet)…so I’m keeping an eye on her. Pinning this over on my “Bark About” board, too! Thanks. Good time for prevention for your deaf girl. I would suggest watching the barometer and sky for her prevention. A drop=reward. Dark skys=reward. Great article, I have not hear much thunder here is San Fran but Layla is scared of rain, balloons, fireworks etc and what I have found that works with her is during the bad rainy weather or fireworks I put a lil doggy t-shirt on her which relaxes her plus I make up a bed in the shower where she goes to lie (has water etc) and cover her with a blanket, I pop in here and there to check up on her and just leave her till she wants to come out. I’m so glad Layla found a safe place. I would recommend looking at the flower essence, panic attack http://amzn.to/2c01kx5 or ego builder http://amzn.to/2ctECPF might just give her a little boost. I have had amazing results with this natural product line. Thanks for such a thorough, well researched & informative post. Finn barks to let us know a storm is on it’s way… sometimes well before we can tell, so your knowledge sharing is certainly going to help us! Thanks, Annette. He’s a good prevention candidate too. Thunder phobia can creep up quickly, then it’s super hard to treat and manage. Our doggie cousin is terrified of thunder. It’s so sad. We’ll share these tips with his mom. Thanks, Lola. So sorry about your cousin. My golden lived his life with this, and it’s tough. Thanks for sharing. Fortunately, none of my dogs are bothered by thunder. These are great suggestions for helping a dog with thunder anxiety. How clever those dogs are that hide in the bathroom and avoid being shocked! Now I’m wondering if some of the dogs are nervous around thunder because they associate it with being shocked. Thanks, Beth. Yes, dogs are so crazy smart! My thunder phobic golden was very sensitive to electricity currents. There was even a place in our yard that had current that he was afraid of. Great article! You mentioned several products I wasn’t aware of, in addition to aspects of the problem I didn’t know, like the static electricity. Thanks for sharing! Thanks, Karen. I try to add anything natural that I can safely do to help ease the anxiety. I think the static has a lot to do with their anxiety. Great information. Kilo the Pug does not really show any fear of thunderstorms but has other fear-based issues. I am a big believer in Counter Conditioning and Desensitization for humans and dogs, especially if combined with medication in severe cases, and Redirecting or giving a dog somewhere to go or something to do when stressed. However, it is very slow time-consuming often frustrating work and it is hard to be consistent. We also tried Adaptil and certain oils but did not notice a difference with Kilo. Massage helps him relax. Thanks. It is tough. Especially thunder phobia since you can’t control the experience, unlike a lot of other fears. My golden was pretty darn extreme, and we managed and improved, but there was never a cure for him. That’s one of the reasons I try so hard with clients to really get on a prevention program as soon as possible. Wonderful article. I didn’t know about some of the products either. I always leave the TV on when I leave the house so the dogs have background noise. I think it helps to calm them? Thanks. Noise is nice. However, with a phobic dog, I don’t recommend tv or radio because they often put “alarms” on during a storm. My golden would react to that noise. Having a specific cd/track helps to ensure that noise doesn’t happen. Thanks for taking the time to write such a detailed post. I have taken in dumped and abandoned cats and dogs near my house for nearly 20 years and one of my current rescues, a wooly husky, who I’ve had for almost four years, and I estimate to be at least 10 years old, developed thunderstorm anxiety this year. Because I have to watch my pennies very closely with currently 10 animals, I have purchased some animal care books over the years and recently wrote a review on them on my blog, Saving Cats, Dogs and Cash. One of my topics that I compared advice to in the five books I reviewed was anxiety from storms. One of the books, I can’t remember which off the top of my head, said not to comfort the dog, as that reinforced their anxiety, which I did disagree with, (and was happy to hear you did too 🙂 as I’ve comforted Lacey because it IS heartbreaking to see them so upset. The interesting thing was that one of the books said to massage the ear, which I did, and it actually really helped calm her down. Our spring storm season seems to be over for the year, but I know I will try that technique again when the next storm comes up, just to make sure it wasn’t a fluke and will be trying some of the other tips you mentioned that were also in my books, like the de-sensitization. I’ve also researched bach flower remedies, which has a pet line that they break down for specific issues. Have you ever tried any of them? I’m fortunate that the majority of my rescues have no big issues that I can’t help them with by just giving them some direction, a calm, loving and consistent environment along with plenty of exercise, but I like the idea of the bach rescue remedy since it has multi-uses, which is always nice with so many animals. Overall, it has pretty good reviews, but in regards to storm anxiety, it has mixed reviews, so like everything, especially with animals, what works for one may not work for another. Just curious about your thoughts on it? Thank you CC for what you do for rescued pets! We need more people like you. Desensitization and behavior modification during the off-season is a must to try to get a grasp on thunder phobia. Calming aids don’t typically work by themselves unless a very mild case. I’ve had more success with the flower essence brand I linked to in the post over other brands. But again, no silver bullets. I’ve just recently added CBD oil, with success. Love your blog! We adopted our English Setter about 9 years ago (she was rescued from a kill- pound shelter and I can’t imagine why her previous owners took her there or what her first hear was like)…..anyway Tansy is very much loved now and gets much needed exercise in our 2 acre yard:) She has always been timid and took awhile to earn her trust.